If you've been looking for a way to generate a much higher income online, take a look around, and you can be sure that most successful entrepreneurs own at least one membership site. The reason for this is that 'information' in many niches is in high demand by newbies and experienced marketers alike. The best part is that when utilising a membership site to drip-feed this information to members, you can quickly generate a recurring monthly income on autopilot. 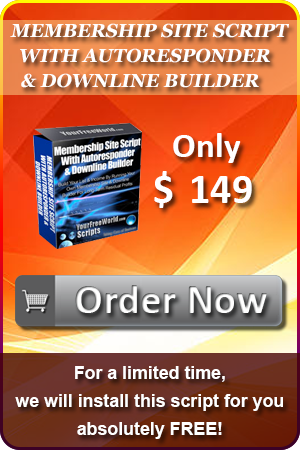 Taking the undeniable popularity of membership sites, and the outstanding income that can be easily generated into consideration, we're proud to introduce you to our highly customisable membership script that has now been updated to include an autoresponder AND a downline builder for extra functionality and supreme profitability. We've designed our script with the layman in mind... That means you don't need to be a technical wizard to take advantage of this kind of script. The control panel makes it easy to manage and administer your program, with all the hard work taken care of in advance for you. Once you've setup your membership site and autoresponder emails, you can be promoting it and earning an income in no time at all! FACT 1: In this day and age of information marketing, if you don't have at least 1 membership site in your business, then you're leaving unclaimed money on the table for your competitors to snap up! FACT 2: Utilising an autoresponder in your marketing campaigns allows the follow-up system to act as an on-call sales team, which can effectively boost the response to your offers dramatically! FACT 3: Dowline builders are one of the quickest ways to build your list and referrals in many programs at once, while multiplying the potential for increased income! 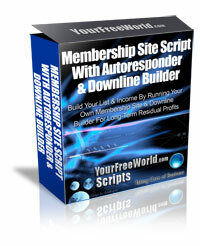 Our membership script with autoresponder and downline builder takes the worry and hassle out of managing and communicating with your members. Once the script is installed on your web site -- you're instantly in complete control with your prospects and members receiving what they want. Expert Status:As your membership grows in popularity, so will your reputation. You will begin to be seen as an expert in your field. Subscribers will automatically look to you for advice, and inherently trust your judgment. Essentially, you will be building and promoting your own brand. When you have a recognized and trusted brand, your new products automatically become trusted as well. Built-In Sales Force: By offering an affiliate program, your members will be able to earn income through the referrals they bring to you. If you are consistently providing your customers great content and quality information, they will be happy to tell others about your site. And by taking advantage of the autoresponder features, you can quickly build your business even further by automatically following up with warm prospects who opt-in for more information. The follow-up system will pre-sell your program to prospects and take care of signing them up for you without lifting a single finger. Add Intrinsic Value: Offering a downline builder in your membership site will help your members to build their referral earnings exponentially, while adding immense value to your site. Check Out The Features Of Our Fully Functional, Customisable Top Quality Membership Script With Autorespnder Below! Set your payment ID's for up to 3 online processing companies so you can receive money immediately, and provide your members with many ways to pay. The include PayPal, Moneybookers and Payza. Show or hide 5 extra data fields from the signup form. Enter the programs that you want to promote to your members. Update/edit/delete the base affiliate link and HTML code for the program description and details. Add/Edit membership level payouts for free and pro member commissions earned up to 5 levels deep. Add/remove bulk subscribers with one click. View subscriber list, pending subscribers and active subscribers. View message history and mailing status. Set the time delay between each message being sent out. Receive a courtesy copy of each mailing to your admin email. Quick view statistics showing the Total Subscribers, No. Subscribed, No. Removed, No. Pending, No. of Admin Mailings sent out and the No. of Autoresponder Messages in the system.